There is nothing I love more than a good interview with someone truly interesting, whether it’s reading one or conducting it myself. 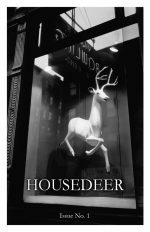 The first issue of Housedeer is devoted to the childhood of Liza Stelle, daughter of Eddie Condon, made through stories told by her sister, Maggie. Berenice Abbott’s famous image on the cover (used with the permission of her estate) was chosen because of her close friendship with Liza. Each issue of Housedeer features a deer cover by an artist, and each extensive interview takes me quite a bit of time to make. But I think each one is well worth the work and the wait both. Send me an email if you would like to order back issues.